Richwood Filtered Cigars are made with the finest tobacco grown in the world - Kentucky Burley Leaf. Each of these discount filtered cigars consists of blended toasted tobaccos that provide a distinctive taste with a smooth finish. This blend also results in a slow - burning premium tobacco with a pleasant aroma. 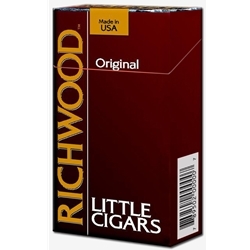 Richwood Filtered Cigars are sure to give you the rich taste you desire at an affordable price. Place an order today and try a carton! You will see why the Richwood brand is quickly becoming a consumer favorite! Richwood Filtered Cigars are distributed nationwide by Xcaliber International located at One Tobacco Road, Pryor, OK USA. Styles available: Full Flavor, Mild, Menthol, Vanilla, and Wild Cherry. Every day smokers are switching to filtered little cigars not just for their great inexpensive prices, but for their quality and superb taste. Richwood Filtered Cigars offers an excellent choice for your smoking needs. Smokers Discounts has made it easy and affordable to buy filtered cigars online. Call us for more details!